Will the impending clean energy revolution cause the next financial crisis? One of the most powerful scenes in Adam McKay’s Oscar winning film, The Big Short, is a scene that includes singer-songwriter, Selena Gomez, and professor of behavioral economics at the University of Chicago Booth School of Business, Richard H. Thaler, explaining how overzealous betting destroyed billions of dollars in assets and nearly brought down the American economy. The scene does a fantastic job of explaining the domino effect of asset destruction. Asset destruction is so problematic for an economy because there’s an enormous multiplier effect created by leverage. Even conservative banks have leverage ratios as high as 10:1, meaning that the destruction of $1mm in asset value reduces the loans the bank can make by $10mm. In 2008, when banks had to write off their real estate assets, because of the mortgage crisis, it had a huge ripple effect on the whole lending market.. The same financial destruction we saw in 2008 with mortgage backed securities and synthetic CDOs is likely to happen in the fossil fuel industry. However, the reason for this impending doom won’t be leverage, it’ll be our move to a zero-carbon-emission future. To keep our planet livable we can only burn one-third of known fossil fuel reserves, which means that two-thirds of the $27T in known reserves will have absolutely no value. This $18T in unburnable fossil fuels is the result of billions of investment over decades, and is collectively one of the largest assets on the global balance sheet. Were the markets to adapt to this reality overnight, the crash would be devastating. Can We Actually Leave Fuels In the Ground? The biggest variable in this future scenario is whether we can keep the fossil fuel reserves in the ground. This is arguably the single greatest challenge in solving climate change, and it has two elements, regulatory and economic. Until recently, there was little reason to be optimistic about our collective ability to put a global carbon emission reduction agreement in place. However after the agreement in Paris, and significant increases in awareness and concern about climate change amongst voters, I’m cautiously optimistic about the ability of the large energy-consuming economies to coordinate significant reductions in fossil fuel use. We’re already seeing the largest manufacturing economy in the world, China, investing more money into solar energy than any other energy source. However, regulation can only get you so far. Playing out a regulation-only approach, you would have enormous demand destruction in the countries who agree to reduce, dropping fossil fuel prices, and thereby creating an ever larger incentive to defect from the agreement. To give an example, if coal gets very cheap because most countries are decreasing their consumption (which is already happening), the benefit to a country without regard for the global agreement, say a North Korea, of building coal plants increases. There’s always going to be someone willing to burn fossil fuels if the solution is only regulatory. We can slow fossil fuel consumption, but not eliminate it, as we need to. Which brings us to the second element in play, economics. Looking to China, they built more solar than coal plants last year, not because it was an agreed to target but because the economics are better (including local environmental costs). Even assuming a downward trend in fossil fuel prices due to reducing demand, solar will be quite a bit cheaper than fossil fuels within 10 years. Within 20 years, simply the variable cost of pulling the fossil fuel out of the ground will be more than the all-in cost of solar. 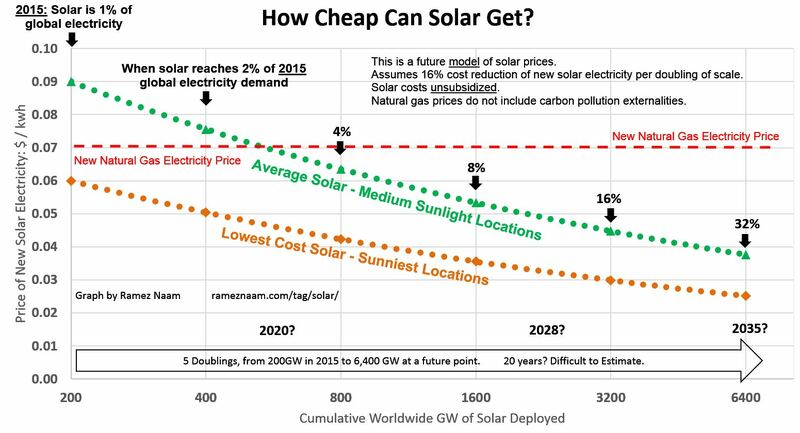 This is the only real solution to climate change, and the continuation of this solar cost curve is the determining factor. What about using the fossil fuels without releasing the carbon? This is a technology that has never been successful. Even if you can remove the carbon cost effectively, long term storage is an enormous problem at any level of scale (the energy industry operates at a mind boggling scale). More importantly though, any carbon-removal-and-storage adds cost by definition, so using fossil fuels without releasing the carbon only accelerates the adoption of clean energy sources. Perhaps we develop a totally new solution 50 years from now, but the destruction of asset value would still be nearly as complete. In Ray Dalio’s excellent How The Economic Machine Works, he talks about the possibility of a beautiful deleveraging: an orderly closet cleaning that brings lending back to reality, and frees up capital for the next round of growth. In the context of fossil fuel reserves, this means the capital markets need to steadily reduce exposure. Instead of one big drop that creates panic, we need to price this new reality into the market gradually. Ironically enough, it’s fortunate there’s not clarity in the market on fossil fuels’ future or the steepness of the clean energy cost reductions. Hopefully the adjustment will play out over years, allowing the expected value of that $27T in fossil fuels to gradually decline in a way that both the capital markets and the energy industry can handle. Moreover, pulling back from fossil fuels frees up lending for the clean energy sources that will need to deploy trillions of dollars in investments over the next 25 years. We need to face the reality that we can either burn the fossil fuel reserves currently known, or we can leave our grandchildren a planet worth living on. But we also need to avoid a panic for the doors, a huge destruction in energy financing capability that would ripple into the broader capital market. The most likely way for that to happen is to continue to collectively keep our head in the sand on the real and significant economic impact of climate change, and therefore the viability of fossil fuels. However that can’t last forever, and if we don’t start to make this adjustment, at some point in the future a huge event will pull our heads out of the sand. That is how a lending crisis happens. Instead, as an energy financing industry, we need to talk frankly about the steadily transition to clean energy sources, and work with our capital market providers to make sure that fossil fuels are not The Big Short 2.0. This article was written by Bryan Birsic, Co-founder and CEO of Wunder Capital. Wunder Capital is helping to accelerate the proliferation of solar by financing the commercial solar revolution. Wunder also offers investors a great way to invest in the future of energy. Learn more about Wunder by visiting WunderCapital.com.